A jabot (/ʒæˈboʊ/ ( listen); from French jabot: a bird's crop) is a decorative clothing accessory consisting of lace or other fabric falling from the throat, suspended from or attached to a neckband or collar; or simply pinned at the throat. It evolved from the frilling or ruffles decorating the front of a shirt in the 19th century. In the 17th and 18th centuries, a jabot consisted of cambric or lace edging sewn to both sides of the front opening of a man's shirt, partially visible through a vest/waistcoat worn over it. This style arose around 1650. Jabots made of lace and hanging loose from the neck were an essential component of upper class, male fashion in the baroque period. Examples can be seen in the movies Pirates of the Caribbean and Dangerous Liaisons. 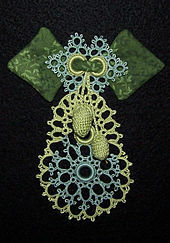 In the late 19th century a jabot would be a cambric or lace bib, for decorating women's clothing. It would be held in place at the neck with a brooch or a sewn-on neckband. Jabots survive in the present as components of various official costumes. The white bibs of judges of the Federal Constitutional Court of Germany are officially described as jabots, as are those worn by judges and counsel throughout Australian courts. Jabots are prescribed attire for barristers appearing before the Supreme Court of South Australia. French magistrate court dress and French academic dress include a jabot, called rabat. It is usually of plain cotton, except that of academic high officials, which is made of lace. Jabots are worn by the judges and Advocates General of the Court of Justice of the European Union. In the United States Supreme Court, jabots are worn by some female justices, but are not mandatory. Both United States Supreme Court Justices Ruth Bader Ginsburg and Sonia Sotomayor often wear jabots with their judicial robes; Justice Elena Kagan, in contrast, does not. Ginsburg has a collection of jabots from around the world. She stated in 2014 that she has a particular jabot that she wears when issuing her dissents (black with gold embroidery and faceted stones), as well as another she wears when issuing majority opinions (crocheted yellow and cream with crystals) which was a gift from her law clerks. Her favorite jabot (woven with white beads) is from Cape Town, South Africa. The Speaker of the British House of Commons traditionally wears a jabot along with a black silk and gold lace robe and lace cuffs when in ceremonial dress. Jabots continue to be worn as part of the highest formal Scottish evening attire and a former part of Scottish highland dance costumes from the 1930s to the 1970s. They are usually worn with high-necked jackets or doublets (Sheriffmuir or Montrose), often with matching cuffs for both genders and a fly plaid of the same tartan as the kilt, draped over-the-shoulder for men. Since the 1970s, a white jabot has been part of the blue and white concert costume of South Africa's Drakensberg Boys' Choir. The jabot is part of the vestment of a verger. The jabot is also part of the ceremonial uniform of girl Queen's Scholars at Westminster School. 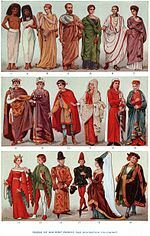 ^ Caulfeild, S. F. A. Encyclopedia of Victorian Needlework, [Dictionary of Needlework]. A. W. Cowan, London, 1882, (facsimile edition, Dover Publications, NY, 1972) v. I A-L, pg. 274. ^ "CURIA - Presentation of the Members - Court of Justice of the European Union". curia.europa.eu. ^ Liptak, Adam (8 September 2009). "The Newest Justice Takes Her Seat". The New York Times. Retrieved 2018-04-06. ^ "Kagan on not wearing a Neck Doily – "In my real life I'm not a frilly, lacy person"". Joshblackman.com. 2010-12-27. Retrieved 2013-07-29. ^ a b "Justice Ginsburg Exhibits Her Famous Collar Collection". News.yahoo.com. Retrieved 2015-03-20. ^ a b MAKERS Team (2014-08-01). "Justice Ruth Bader Ginsburg Owns a 'Dissenting Collar'". MAKERS. Retrieved 2015-03-20. ^ "WESTMINSTER ELECTS THE FIRST FEMALE QUEEN'S SCHOLARS". www.westminster.org.uk. 2017-09-20. Retrieved 2019-03-04. This page was last edited on 4 March 2019, at 16:13 (UTC).